These Miracle fruit Trees (Synsepalum dulcificum) are ready to blossom. What is a Miracle fruit? The berries from this tree can make that metallic taste from a chemo treatment go away. 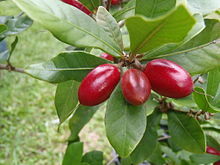 A Miracle berry plays with your taste buds' for about a half hour, Sour tastes Sweet. The effect is due to Miraculin that is used commercially as a Sugar substitute. A perfect gift for the indoors this plant can be kept in the container in a well lighted area. Go to Nursery website for info on all our tropical fruit trees. Note: we cannot ship into CA or AZ.